that they are endowed with certain unalienable Rights, that among these are Life, Liberty, and Democracy as a means and as an end. That to secure these rights, Governments are instituted among us, deriving their just powers from the consent of the governed, which is the very essence of the democratic ideal. That whenever any Form of Government becomes destructive of these ends, it is the Right of the People to alter or to abolish it, and to institute new Government. Wisdom, indeed, will dictate that Governments long established should not be changed for light and transient causes. But when a long train of abuses and usurpations, pursuing invariably the same Object, evinces a design to reduce them under absolute Despotism, it is their right, it is their duty, to throw off such Government, and to provide new safeguards for their future security. Such is now the necessity which constrains us to address the workings of the electoral college, the validity of the election, the qualifications of the proposed President-Elect, and the long and now successful attempt to undermine the democratic promise foundational to our nation, never yet perfectly realized but now in danger of perishing altogether. He has shown a desire to overrule the will of the people and the rule of law, and to establish a tyranny. He has defended torture; racial and religious discrimination; the internment of innocents; and collective punishment; and his rise has inspired a wave of hate crimes and acts of violence that menace many resident in this country and undermine the laws established to protect the rights and persons of people of all colors, religions, genders, and sexual orientations. He has boasted of sexual assaults; verbally demeaned and threatened, and otherwise indicated a refusal to acknowledge the rights of women; and has demonstrated an incomprehension of our humanity, dignity, and rights. He has denied the reality of climate change as acknowledged by every current world leader and stated an intention to destroy all measures to address that looming catastrophe. He has shown a reckless, petty, easily swayed, and capricious character that should absolutely deny him access to nuclear weapons, and he has shown himself, from his incomprehension of foreign policy precedent to his sexual misconduct, unfit to be the Commander in Chief of a powerful army. He has chosen to appoint people who range from utterly unqualified (Ben Carson for Housing and Urban Development) to extremely dangerous (conspiracy theorist Michael Flynn for National Security Advisor — a man fired from the Obama Administration for his instability, falsehoods, and inappropriate behavior) to openly hostile to the mission (climate denier Scott Pruitt, with a record of attacking the EPA, science, and regulation), thus threatening to amplify his own incompetence and destructiveness through such choices. He has already begun to turn the presidency into an opportunity to profit and plunder and to override the interests of this country for the interests of his many businesses; he has concealed the allegiances, ties, and dependencies of those businesses by hiding his tax returns, in violation of all custom; and he has, as many elected officials protest, violated the Constitutional ban on “emoluments,” or profits. He has proposed tax cuts for corporations and the extremely wealthy that, together with his cabinet of billionaires, aspire to increase economic inequality to levels that may approach that of eras preceding the twentieth century. He has conducted himself in so alarming a manner after an election so irregular that elected officials from both the Republican and the Democratic parties have demanded investigations into his finances, his conflicts of interest, and the potential corruption of the election; answers to these questions should be ours before a transfer of power happens. He and his advisors have committed to take further dramatic action to attack democracy itself, by making participation in the democratic process more difficult and onerous, with the express intent of limiting the number of people who can vote — so that the small minority of Americans who support his policies can allow those committed to great selfishness and greed to rule over the majority. He has lost the popular vote by more than 2 percent or 2.7 million votes, which renders it clear that he was not chosen by the majority of the people to become president — and this in an election where disenfranchisement of millions of people of color, along with flaws, errors, failures, and allegations of corruption in the opaque election process, appear to have given him undue advantages. That even under those advantages he is not the winner of the vote of the people is yet further grounds for the vote of the electors to protect us against the harm he poses to our public safety, our standing in the world, our rule of law, and our slow but steady advance toward a more perfect union and a more democratic nation. 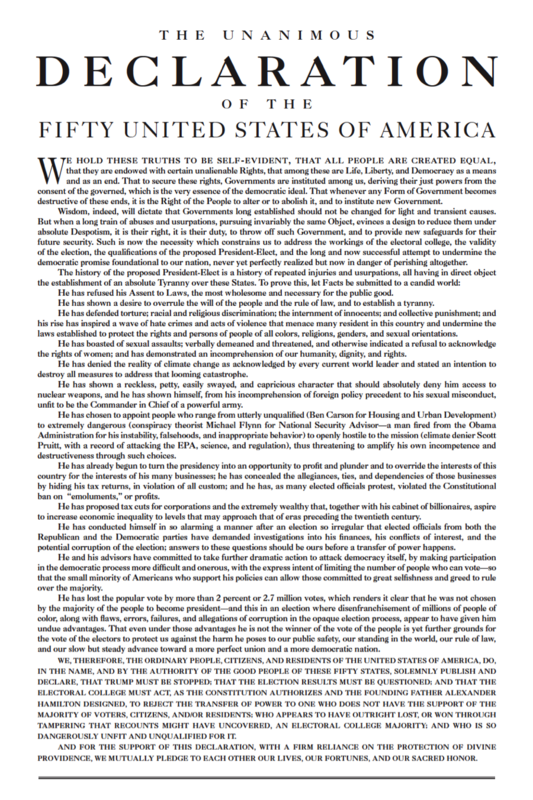 We, therefore, the ordinary people, citizens, and residents of the United States of America, do, in the Name, and by the Authority of the good People of these fifty states, solemnly publish and declare, that Trump must be stopped; that the election results must be questioned; and that the Electoral College must act, as the Constitution authorizes and the founding father Alexander Hamilton designed, to reject the transfer of power to one who does not have the support of the majority of voters, citizens, and/or residents; who appears to have outright lost, or won through tampering that recounts might have uncovered, an Electoral College majority; and who is so dangerously unfit and unqualified for it. 3. Join the #DefendDemocracy Team in your state mobilizing to #StopTrump Dec 19th by joining the google group for organizers from your state. 4. Share information and get updates at the #StopTrump + #DefendDemocracy Facebook Group.